Cat should be careful on the road H. You might need some lessons. Uh oh! Doesn't look like Toonces is a very good driver. Better leave the driving to your mum Harley. There are many who CAN drive that should not, Harley! srsly. Have a purrfect Monday, honey pies! 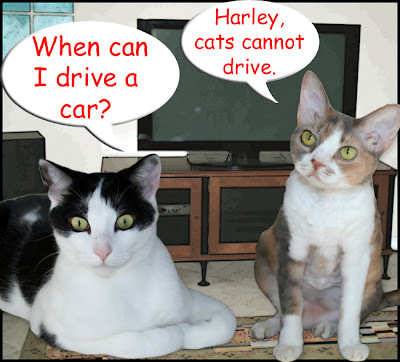 Maybe you'd be a better driver than Toonces, Harley! Yup Harley, we don't think you should get behind any wheel. Might be dangerous to everyone's health. You stay right there and just pester Daisy. Take car.. I loved it when Toonces and Spunky played Ping Pong. public transportation is always an option too. I LOVED Toonces! He always took his mom and dad for a drive. xoxox Not good consequences tho. TOONCES!!!!! 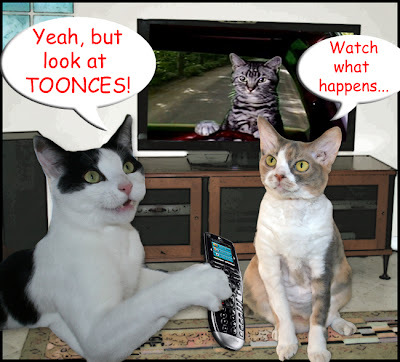 you should become TOONCES!!! Oh Harley, you "drive" me crazy! Oh Harley, you are so brave. I think you might need thumbs to drive a big wheel though. Maybe you should just ride with your mommeh, that way you can look around too! You want to know a secret, Harley? Our mum was wearing a Professor Daisy pin when she went to renew her license last time, so Daisy is on her drivers license! harley, we thinks if you put yer mind to it, you could prolly drive a car. not well, mind you, but you prolly could. howefur, we fink yer mommeh would much rather that you din't. 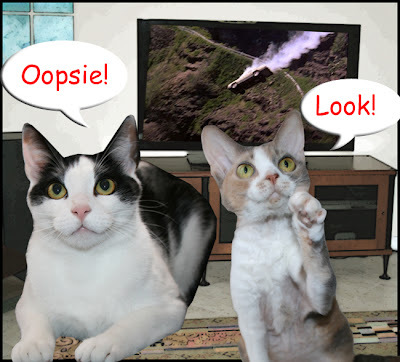 If Toonces is any indication, I'd say stay off the road... LOL! This made me giggle today. Our tiger stripe cat is named Toonces. Not many people get the reference. This made my day. No driving for you Harley. I bet Harley would be a much better driver. We think you should get a chauffeur. We're pretty sure Toonces needs more driving lessons. I don't know, you might be a better driver than some that are on the road - like the idiots who text and drive! 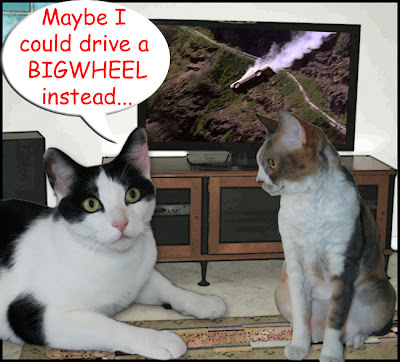 waddya meen cats canna drive cars...thatz what de CATillac iz all about :) !!! Oh Harley!! Be careful those cars are not very safe for kitty's!! Have a wonderful Monday!! We think you would be a better and safer passenger than a driver. Besides, Harley, all cars ever do is take you to the vet. At least that has been my experience. Mebbe ya could paddle a CATamaran, Harley! Oh Harley, big wheel might be more difficult to control! But you can always learn at driving school..right? Hmmm... better not try it! ...but guess what? I'm driving the Glogirly-mobile on a big secret mission this week! I even have a flash light. Looks like my human driving! Maxwell: Um. Daisy? could you let us know when Harley gets his big wheel? I wanna go buy a safety helmet. Just in case.